Parts and spares for the Model A Ford Zenith Carburetor. 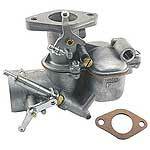 Parts and spares for the Model A Ford Tillotson Carburetor. Parts and spares for the Model B Ford Zenith Carburetor. Parts and spares for the Marvel Schebeler Carburetor that was sold by Sears as a replacement for the Model A Ford. Fuel parts including Fuel filler cap, sediment bowl, fuel lines, shut off valve, 6v fuel pumps, 12v fuel pump. Fuel related controls, choke rods, accelerator parts, carb linkage ball stud, footrest parts.